Usually, as development progresses from preclinical to a more advanced clinical stage, reality begins to set in: problems become apparent that were not anticipated, efficacy may be less than expected or hoped for, and the safety margins may shrink to a single-digit factor. In other words, as more data accrue, irrational exuberance tends to fades away replaced by cold facts and a therefore more realistic assessment. Finally there is sometimes the recognition that the product never deserved all the hype and praise from the outset. 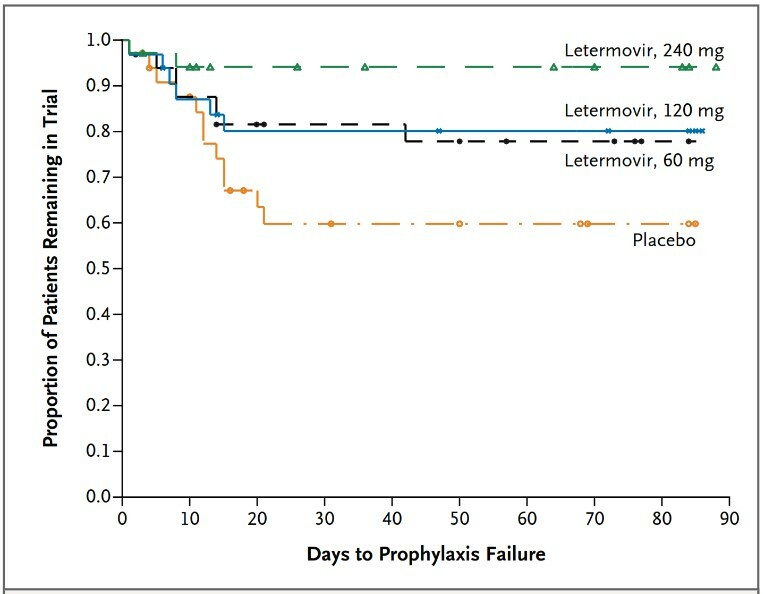 Letermovir (AIC246, MK8228) followed a different trajectory: each new morsel of clinical data made it look better as development progresed. Here is a quick summary of letermovir’s features: It is a new antiviral with a novel MoA, a terminase inhibitor specific for CMV. Letermovir can for added efficacy be combined with the older ganciclovir, a DNA polymerase inhibitor. Devoid of a mammalian target, it is highly selective for the viral enzyme that operates by cutting CMV DNA strands from the rolling circle for packaging into capsids. The drug is incredibly active, with an EC50 against CMV in the low nano-molar range making it approx. 1000x more potent than ganciclovir. It is well absorbed, has a long half-live (10 h), and is excreted primarily via the biliary route. Not all is golden, though. The drug does inhibit several cytP450 enzymes, most notably 3A4. Hence, we would expect a number of drug-drug interactions, esp. in concert with anti-rejection drugs. In a sizeable (N=131) double-blind Phase 2 study in HCT patients, increasing doses of letermovir were administered prophylactically for 12 weeks after engraftment. There was a statistically significant dose-dependent response compared to placebo; letermovir treatment reduced the incidence rate of significant CMV infections from 64% (placebo) to 29% (letermovir high dose). After excluding patients with documented viral replication at entry, there were no virologic failures in the high-dose 240 mg PO qd letermovir arm. Importantly, renal or bone marrow toxicity were not detected. Can it get better than that? In a smaller study in renal transplant patients, the drug was also well tolerated and showed efficacy. So, when Merck informed us on October 19, 2016 that the drug had “met its primary endpoint” in a pivotal Phase 3 trial resulting in reduction of clinically significant CMV infection, we were truly excited. We had high hopes for letermovir and were keen to hear the full story, the rest of the story. But Merck was tight-lipped about efficacy details, there was not a word about safety / tolerability. Further information was promised at a ‘future scientific meeting’. The next news tidbits came to us from the BMT Tandem Meeting this February,. However, the information provided was very sparse. We refrain from repeating the few snippets of information made public in various press releases. The Oncology Nurse Advisor sums it up well enough: “Letermovir reduces CMV infection, improves survival”. Clearly this cannot be not the full story. We know for a fact that the drug was unable to prevent CMV recurrence in almost 40% of patients, a very disappointing finding which raises all kinds of questions. Was the 480 mg qd dosing regimen adequate; was the dose-adjustment for cyclosporine-treated patients optimal? What were the PK profiles of patients for whom prophylaxis failed? Why, when and in which subpopulations of HSC patients did CMV recur? Was CMV suppression achieved at least until engraftment, ie., when ganciclovir could safely be administered? What is the genomic make-up or resistance profile of the break-through viruses? Also, why was the incidence of GvHD not reduced in the letermovir arm? What was taking Merck so long to present the letermovir data in a comprehensive fashion? Where was the detailed press release that we would expect from a company that had just hit the jackpot? Was Merck too busy with its Keytruda studies that everything else was taking a back seat? One of the last AiCuris publications was in the New England Journal of Medicine, but any peer-reviewed journal would have sufficed. If Merck’s publication strategy sounds strange to you, you are not alone. It reminds us of a Conan Doyle story, the case in which the dog did not bark – and yes, this lack of publicity is a curious incident. When Big Pharma takes over development from a small VC, development, medical affairs and marketing decision making switches hands. Letermovir was the one and only project at AiCuris for a long time, but now the original developers were just coming along for the ride. Most VCs have to relinquish control when they sell to a big name, deep pockets pharma company whose actions are driven by competing projects and interests and – borrowing from chaos theory – other ‘strange attractors’. Delayed publication has happened before but after the disappointment with maribavir (ViroPharma) and brincidofovir (Chimerix), we were looking forward to a break, and hopeful for letermovir. Hence, we were anxious to learn from this important trial. We have been waiting a long time for a ganciclovir replacement and can wait a bit longer for Merck to get its act together. But without full disclosure of the Phase 3 letermovir study data, we are not yet ready to join in the cheerleading. This entry was posted in Recent Literature, The News, The Viewpoint and tagged AIC246, Aicuris, anti-rejection drugs, antibiotic blog, brincidofovir, Chimerix, CMV terminase inhibitor, CMV therapy, cyclosporine, cytochrome P450, drug-drug interactions, ganciclovir, GCV, GvHD, Harald Reinhart, HSCT, Keytruda, Letermovir, maribavir, Merck, MK-8224, MK-8228, pembrolizumab, publication delay, ViroPharma by Harald. Bookmark the permalink.